To cradle us and shelter us from the worldly harm. To care for us and guide us through our choices and our plans. To understand and give our lives a happy, loving start. Why God created Mothers, is not a mystery. . . He meant to share His love with us and did it perfectly. 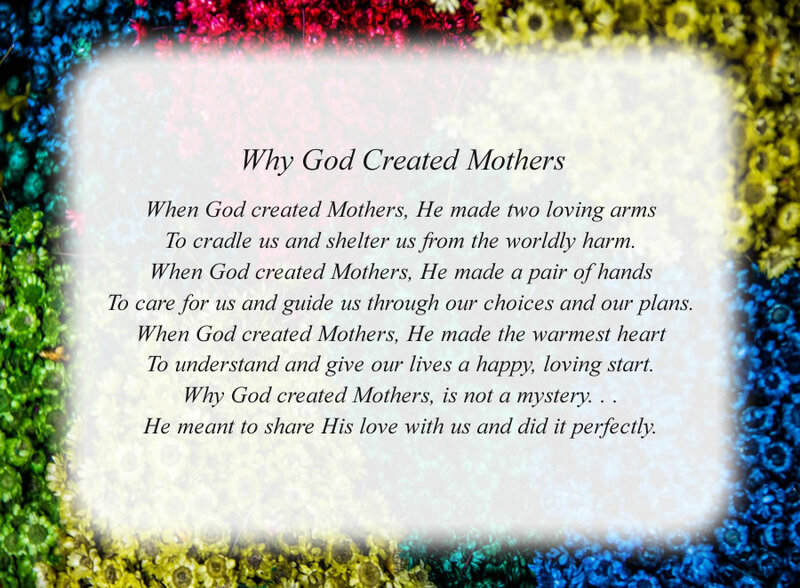 The poem, Why God Created Mothers, is free and printable by opening or downloading using one of the three links below. One link is for the poem with the Colorful Flowers background as shown above. The second is for the poem with a plain white background. The third link is for the Colorful Flowers background without the poem, in case you would like to print a different poem on this background.